Had a while coming from under the dash yesterday. Ballasts were at 100%. Did it when boat was in motion. Once you pulled power off to stop it would continue for about 20 seconds and slowly die off. Seemed to cycle with wave motion as we were coming to a stop. I suspect a check valve from other posts in the past. Any info on the exact location and if its an easy part swap? It’s probably the duck bill in the anti siphon loop. Mine squeak a lot after I turn off the pump after filling. Normal. As @teamericksonmentioned it is totally normal. I would not even bother replacing because it wont do a thing. It is actually a good sound because it means the vented loops are working properly. They are designed to prevent your bags from siphoning out when the boat is moving. It is actually a good sound because it means the vented loops are working properly. They are designed to prevent your bags from siphoning out when the boat is moving. Can you explain this to me please? I I haven't looked behind the sub so my understanding of the system is limited. I assume there are two pumps per ballast. One to fill through the hull, once the ballast is full it overflows out well above the waterline. The second pump is to drain and pulls from ballast and discharges through the same exit above the waterline. 1st, how could the ballast siphon out through a port ABOVE the waterline (also above the level of the ballast I believe) ? 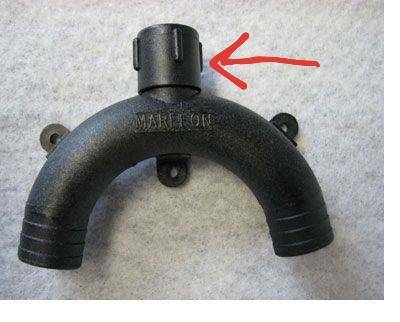 2nd, I expect there is some type of "Y" connector where the overflow and drain lines connect. I would expect the air check valve to simple allow pass when filling and draining. Any help in explaining the system would be great. I could also just start taking stuff apart to learn but I'd rather impose on the groups knowledge. On a Bu, the vent and drain each have their own outlet thru-hull, so no sharing, no Y or T.
Not check valve on the vent line with a tank. The vented loop is in the fill line. The full ballast tank/sac can and will drain right back through the fill plumbing without the use of a vented loop or traditional check valve. The sound you hear is the vented loop letting air in, breaking the siphoning. As @MLAstated the vented loop is in fill line. Malibu uses aerator style pumps which have no rubber impeller. With the fill pump being on the bottom of the hull water would venturi back out the fill line when the boat moved without the vented loop. It basically stops the siphoning effect when the boat moves. Aerator pumps are pretty much bomb proof. They can be run dry for hours with no damage. Occasionally debris can lock up the impeller (which is plastic) but are also very easy to clean out. I attached a pic of what a vented loop looks like. They are mounted as high up as possible to be the most effective. The duck bill is indicated where the red arrow is. If you unscrew that cap the duck bill is located under it. Wow, Great info! Love this forum of Knowledge. Correct me if I've got this wrong....The part of the system I didn't understand was that the aerator pump is not a one way system. When the pump is running it forces water in the correct direction, but when off water can run back through the pump and siphon back out. The vent prevents that. Think of an aerator pump as a box fan. On, air goes in the desired direction, Off, its wide open. When on, water is forced in the fill direction. When off, water can flow right back through it into the lake. The vented loop allows forced to flow one directed, but air back in when water flows the other direction. Once the air comes in, the siphon is broken, and the passive draining stops.